PLEASANTON, Texas (April 6) – Everyone loves a first-time winner and when that person overcomes a physical challenge, even his competitors show their respect. 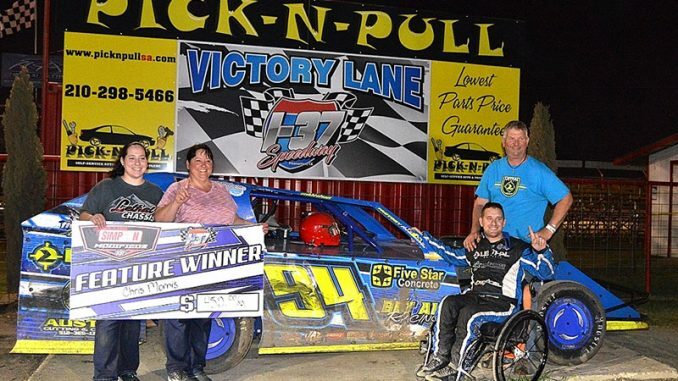 Using only hand controls, Chris Morris dominated the IMCA Modified 20-lapper Saturday at I-37 Speedway and grabbed the victory much to the excitement of the crowd. There was hardly a dry eye in the place. Morris, who started ninth, saw the bottom open up on green and quickly moved up behind leader Jamie Campbell, Bill Pittaway, and defending track champ Rick Green. He picked off third from Green then got by Pittaway for second. Using the bottom, Morris pulled alongside Campbell on lap three and had the top spot on lap four, bringing Green along to second. From there, he began to stretch out his advantage. Cody Leonard, who denied Morris his first-ever win in the season opener, was on the charge moving up to fourth. Stretching out his lead to a full straightaway, Morris only had slower traffic to contend with. Even that didn’t deter him as he diced through, increasing his margin to a half track as the white flag waved. With the crowd on its feet, C. Morris crossed the line ahead of Green and Pittaway. Feature results – 1. Chris Morris; 2. Rick Green; 3. Bill Pittaway; 4. Cody Leonard; 5. Chris Carroll; 6. Jamie Campbell; 7. Donald Banker; 8. Marcus Mikulencak; 9. Mike Morris; 10. Rob Sanderson; 11. Landon Bednarz; 12. Justin Delgado; 13. Dillon Tindall; 14. Jason Borlace; 15. Chris Jones. By J.M. 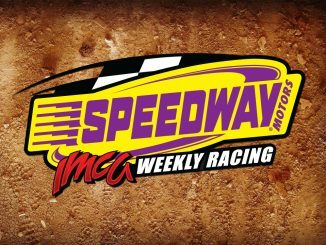 Hallas PLEASANTON, Texas (July 28) – Rick Green took home the top money in Saturday’s IMCA Modi­fied feature at I-37 Speedway, but it wasn’t easy after midway. Green had jumped out to an early lead from the eighth starting spot and put some distance on Jeremy Davenport, Cody Tidwell, Jake Rollins and Greg Dinsmore. Dinsmore advanced to second but was half a straightaway back until caution flew on lap 13. The restart saw Dinsmore and Tidwell on Green’s bumper, but as the two fought for second Green inched ahead. Dinsmore’s run to the front ended with brake problems, leaving Tidwell to take up the charge on a re­start. Green got a couple car lengths on Tidwell and Carroll with Flanagan and Cody Leonard side-by-side for fourth. 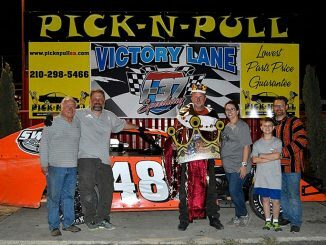 Tidwell gave Green a look on the final lap, but Green held him off for his first I-37 victory in sev­eral years. By J.M. 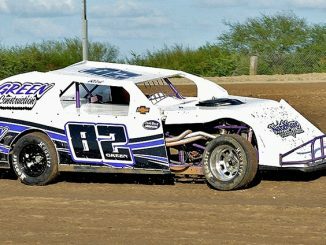 Hallas PLEASANTON, Texas (April 22) – Talon Minten outlasted the field to take home Sunday’s IMCA Modified main event at I-37 Speedway. Minten got the lead from early point man Chris Morris, who drives with only hand controls, then outpaced the remaining field for the win. “We had a good car,” said Minten. “With the wrecks and cautions I’m glad I started up front and stayed clear of it all. The track wasn’t too bad for our feature, I felt like the top line was dominant so whoever got up there first would likely stay out front.” Dillon Tindall was second and Morris ended his night in third. The scheduled Saturday show at Pleasanton was rescheduled because of inclement weather and wet pit conditions.